Nice selection of subjects on this sheet, most of them in SEA camouflage, which is fine with me, especially as three of them are Phantom IIs. First up are a pair of F-100Ds. One is with the 492 TFS and the other with the 493 TFS, both based at Lake heath, England during 1970. 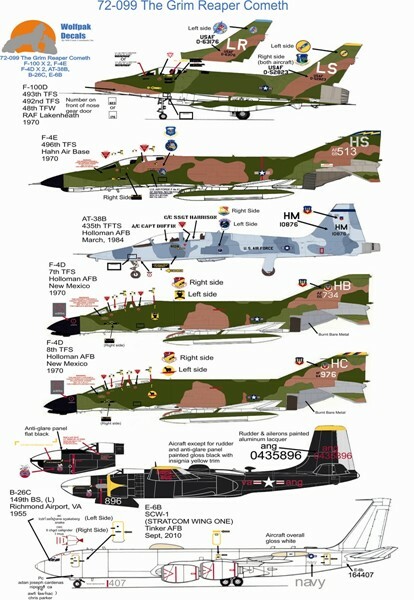 These aircraft differ by serial, tail code and unit badge. Next is the first of our F-4s. This one is an F-4E based at Hahn, Germany during 1970. It has the early gun nose and light grey tail codes. A nicely done AT-38B is next with the 435th TFSTS at Holloman AFB in 1984. These planes were used for fighter-bomber training. Many of these were later converted to T-38C standard when the units disbanded. Also based at Holman, this time in 1970 are a pair of F-4Ds. The first is with the 7th TFS with the HB tail code. The other is with the 8th TFS and carries the HC tail code. For the interested. The 7th is flying F-22s as the type’s training squadron. The 8th was deactivated in 2011. What I think is a great option is an all-black B-26C of the 149 BS, Virginia ANG in 1955. Note that only one of the large ANG decals is shown in the sheet image. The sheet you get will have two. Finally, an E-6B from SCW-1. Apparently, when the Navy moved VQ-3 and VQ-4 to Tinker AFB, the planes were modified so they could also perform the ABNCAP mission as well as TACAMO. The result is the B model. This aircraft is overall white and one will need a conversion set to replicate this plane.